In 1993, UK artist Rachel Whiteread's burgeoning interest in lost architectural space led her to document the destruction of various East London tower blocks. The resulting series of prints (Demolished (1996, above) would, she believed, "be completely forgotten" along with the razed buildings themselves. Yet if anything, their significance has become more apparent in relation to a growing body of art centred on an investigation of the high-rise. And of all those associated with this appraisal, French artist Cyprien Gaillard (left) is currently the most feted. His professed concerns - "... first, the question of Modern Utopias and the architectural ruins they produce, and second, the definition of a new urban form of Romanticism" - are manifest in works encompassing video, photography, etching, sculpture and performative intervention. While still at art school (Lausanne's Ecole Cantonale des Beaux Arts) Gaillard commissioned a traditional landscape painter to paint bucolic views of Swiss suburban housing projects (Swiss Ruins, 2005). 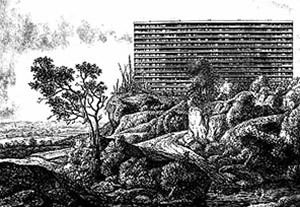 In the same year, he introduced the image of a tower-block into 17th century Dutch landscape etchings (Belief in the Age of Disbelief, 2005), (below). For Gaillard, "these buildings have always been part of my vision of a landscape.... What first drew me to the projects was a sort of romantic fascination with them, much like the fascination French Ruinists had for derelict scenery." But the fact that this appreciation is largely unshared has galvanised his practice into an active concern with recording both their existence and demise: "Many European countries... have taken up overbearing renovation politics that imply the destruction or the entire reconstruction of these buildings. The urgency of this situation has driven my work further than simple fascination and has brought me closer to these unauthorized ruins, as I might be one of the last to capture them." Their presence, and indeed destruction, features heavily in Gaillard's films. 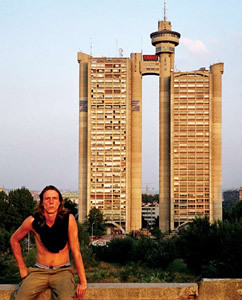 The acclaimed Desniansky Raion segues from an opening view of Belgrade's futuristic city gate into an epic brawl between youths in a Russian housing project. Found footage of the demolition of a block near Paris - an 'event' accompanied by fireworks and a light display - is juxtaposed with a flight over Kiev revealing a monumental assembly of high-rise akin to a looming, modern-day Stonehenge (left). Gaillard's championing of the brutalist tower extends to	rehabilitation of remnants of the buildings themselves through a growing number of interventions providing monuments to "dead architecture". 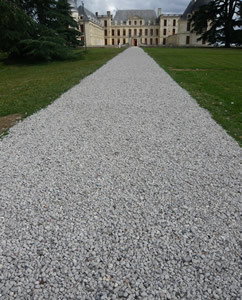 In 2008, for example, the crushed concrete remnants of a suburban tower block were scattered on the sweeping approach to a Renaissance chateau (La Grande AllŽe de Oiron, left). In the same year, a bronze sculpture of a duck removed from a derelict Parisian housing project was installed on the terrace of Berlin's Modernist masterpiece Neue Nationalgalerie (Le Canard de Beaugrenelle). And again in 2008, the rubble from a dynamited Glaswegian estate was transformed into a 4-metre memorial obelisk (Cenotaph to 12 Riverford Road, Pollokshaw, Glasgow). In addition to these scattered monuments, Gaillard cites even more ambitious plans to work with entire buildings: "I have this project where I want to move all these buildings that are about to be destroyed into a big park I will create in the south of France ... these buildings will be allowed to become real ruins, in a typical French romantic landscape, with its hills, lakes, and waterfalls. This park will define a new urban form of Romanticism, very much like the French 'parcs aux ruines' built in the 18th century." Despite - or perhaps due to - the dizzying breadth of Gaillard's acclaimed vision, certain of his stated concerns can appear inconsistent. He denies charges of nostalgia, for example, claiming instead that "I do believe the world, and life in all its forms, is ruled by the laws of entropy. I celebrate this principle of unavoidable decay." Yet since the notion of entropy dictates that all will eventually crumble into ruin, speeding up the process through demolition is hardly a rule-bender. Gaillard is more nostalgic than perhaps he likes to believe - and his work probably all the more resonant for it. British artist Ryan Gander has likewise produced several works directly related to urban planning. Unlike Gaillard, however, his pieces eschew specific viewpoints in order to reflect the highly problematic perception of postwar social housing. 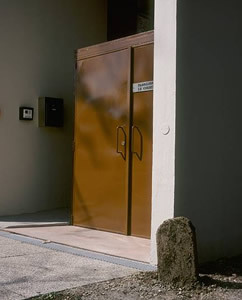 The wittily named Milestone / Stumbling Block, (2006, left) is created using fallen concrete gathered from Le Corbusier's infamous Marseille Unité d'habitation, completed in the early '50s. Installed in various locations, the title of Gander's work perfectly encapsulates the polarisation surrounding the International Style and its simultaneous perception as pioneering model or architectural aberration. His block's dual resemblance to a miniature gravestone/milestone adds further subtlety to a dense compression of meaning. For the 2005 work Your life in three acts, Gander added twenty-six long-gone streets to standard tourist maps of Sheffield, a British city characterised by extensive post-war redevelopment. By quite literally mapping changes to the historic city centre, Gander's ghostly cartographies serve as a graphic reminder of areas lost to urban regeneration, a call to consider the merits of redevelopment against that which was erased. "I was in Glasgow to film the demolition of (a) tower block.... 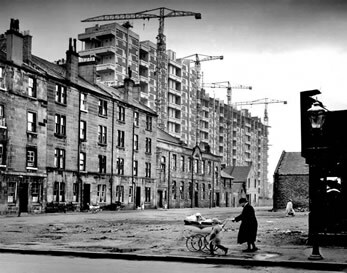 The scenario is always the same - in the next five years the Glasgow Housing Association will demolish half of these buildings in order "to change the skyline of the city", to use their words." Detractors, of course, claim that such buildings represent a dismal failure of the utopian idealism on which they were predicated. High-rise estates are, they believe, clearly associated with crime, vandalism and other social problems. Their demolition provides an opportunity to forge 'new communities' based on lessons learnt the hardest way. Others, however, even if not particular advocates of the modernist style, point out the inaccuracy of levelling blame at the buildings themselves. Factors such as poor general upkeep and the density of low-income, often marginalised residents are, they suggest, central to their apparent failure. 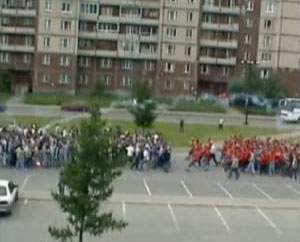 The tension between such wildly opposing views is captured metaphorically in the violent confrontation between rival gangs in Gaillard's Desniansky Raion (below). It is also implicit in a 2007 work by UK artist Catherine Yass in which Glasgow's Red Road towers played their own leading role.